its archive of media releases? 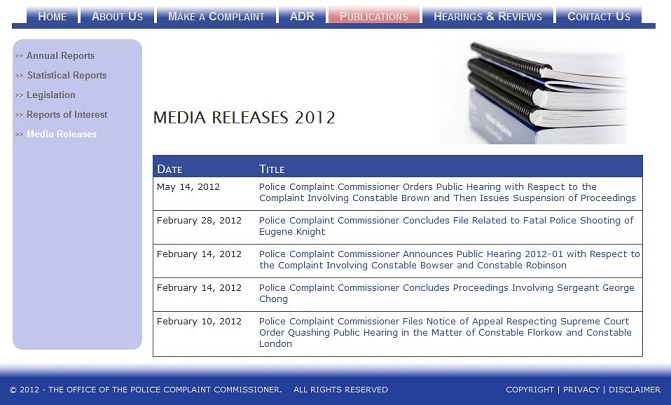 Heres more evidence challenging the honesty and transparency of B.C.s Office of the Police Complaint Commissioner. The OPCC has deleted its archive of media releases. Prior to February 18, the archive went back a few years. But not anymore. Now the archive lists only the last five media releases, the oldest being February 10. Previous releases were deleted on or after February 18, when I last checked. The reason might have something to do with this article, which appeared in the New Westminster Record on February 17, in response to a Record news story on February 10. In the February 17 letter, I pointed out the OPCCs secrecy involving two cases  Vancouver Police Const. Taylor Robinson, who was caught on video pushing a disabled woman to the ground, and New Westminster Police Const. Sukhwinder Vinnie Singh Dosanjh, who returned to the force after a three-year, seven-month paid suspension following very serious off-duty allegations including entering a home illegally, assaulting a woman and possessing a firearm illegally. The public record shows that the OPCC, like the police, kept these incidents secret. The media found out about them only by accident. I believe the OPCC colluded with both police departments to cover up these very serious incidents. Unless a case gets publicity, caught on video or the support of an influential group like the B.C. Civil Liberties Association, the OPCC takes part in police cover-ups. Now the OPCC has consigned its archive of media releases to the memory hole, making it more difficult to determine what the agency has and hasnt made public. The OPCCs secrecy  and, I maintain, collusion in police cover-ups  might not be surprising, given the agencys police culture. Police complaint commissioner Stan T. Lowe is a former Crown attorney who was a member of the Criminal Justice Branch executive management that unanimously decided to exonerate the four RCMP officers involved in Robert Dziekanskis Taser-related death. His senior staff consist almost entirely of ex-police and people very close to the police. Most of them came directly from the same B.C. police forces they supposedly oversee. They face no scrutiny from the provincial Ombudsperson, any political party, the BCCLA or, for the most part, the media. In a development that received almost no media coverage, the OPCC has been given investigative authority over B.C.s new Independent Investigations Office, which is scheduled to start operations this summer. This was a cynical government manoeuvre to evade a key Thomas Braidwood recommendation  that the IIO come under the provincial Ombudspersons authority. Ontario Ombudsman Andre Marin has proved crucial to keeping that provinces Special Investigations Unit relatively transparent and effective, making it by far Canadas best police accountability agency. Braidwood, meanwhile, changed his position radically in order to support the governments heavy-handed revision of his recommendations. B.C.s IIO will fall far short of the SIU for several reasons. One of them is that the IIO comes under the authority of Stan Lowe and his crew of ex-cops at the OPCC. As much as possible, they operate in secret. Furthermore, evidence strongly suggests they take part in police cover-ups. The missing media releases are just another indication.